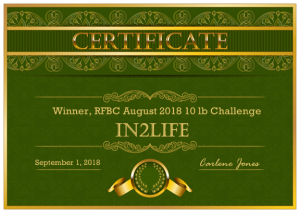 In2Life Hits Goal with 35.4 lbs Gone in 3 Months 11 Days! Three months is not a long time for someone to be at camp. It usually takes longer to get to know someone and feel connected to them. In2Life came to camp, made herself at home and worked with me closely, day by day sometimes to accomplish what she hadn’t been able to do on her own. Her journey wasn’t easy. She took a trip to another country while here and she hated doing 2 hours of walking a day, but when she did just one the weight loss wouldn’t happen. So she would go in spurts. Some days one hour and then disappointment with the scale. When I pushed her to push, she’d do the 2 hours and the weight would drop off. She never fought me on this, she just did it because she came to camp to win (lose) and was determined to get it done regardless if she wanted to do the walking or not. Her food was spot on all the time. I think though she is very grateful to be done with weight loss and can drop back to an hour a day as she maintains her weight. My favorite In2Life story is when she was out playing soccer with her kids and sprained her ankle a couple weeks ago. No, I’m not cruel. What I loved is that she has now created a lifelong memory for her children. Not of a mom who watches them play through a window or even in the bleachers, but one who plays with them. That sprain will cement that memory and will be a story they tell. In2Life isn’t sure about her lifelong diet so we are going to start by transitioning her to our Wholy Rawker diet with a little more protein/fat and heavier starches and see how she does. One thing I do know about her is that she is going to keep this weight off and do whatever it takes. I have loved having In2Life at camp. Whenever someone new joins she tells them: As I always say, just do whatever Carlene tells you and you’ll be to goal before you know it!! I smiled when I saw she had added it In Her Own Words. I think my comeback to that is: Listen to what In2Life says, she knows how to do this! I can’t believe it but I’m now 48 years old! I’m married and a full time mom to five children ages 13-23 years old. About five years ago, I quit my night shift nursing job. At the time I was about 50 pounds overweight and my blood pressure was rising. I had seen too many sick patients in the hospital, and I did not want to follow the same path. After a ton of research about health, I decided that plant based vegan was the best option. I lost about 20 pounds, but then stalled. Although I kept that 20 off for the past five years, I knew I needed to lose more. Unfortunately, nothing was working. One day while online, I found Carlene’s article about being vegan and not losing weight. That was me! I began stalking RFBC and trying the best I could to follow the advice. At the time, Carlene was only accepting clients who had 50 pounds to lose, so I couldn’t join. Although I wanted to succeed, sticking to the plan without the help of Carlene was difficult, nearly impossible. A few months later, Carlene opened RFBC to clients who had 30 pounds to lose. Finally, I was in! 2. What have you learned the most about yourself and your relationship with food since starting RFBC? One of the things I have learned is the importance of accountability. Prior to joining, I was trying to do this on my own. I failed. Having the accountability of Carlene and the other women made a huge difference in my journey. I didn’t want to admit to others that I had eaten off plan, so I used that as motivation to stay on plan. Also, the daily discussions and the conversation groups were super helpful. The daily discussions gave me topics to think about while the conversation groups helped me stay committed. Lastly, Carlene was always there for me. She would tweak my meal plans and my exercise routines when needed. She also provided strategies for social events, stressful situations, and more. I couldn’t have done it without her. 3. What Physical and mental health benefits have you noticed since joining RFBC? Physically I have lost 35 pounds! I’m full of energy while my legs feel strong and powerful. I haven’t felt this wonderful in years! Mentally I couldn’t be happier! It’s amazing to have set a goal, worked toward that goal, then accomplish that goal. Who wouldn’t love that? 4. What have been some of the biggest highlights of your journey? The best highlight of the journey is that it was short! It only took a little over three months to lose 35 pounds. It was unbelievable! I also have enjoyed the compliments from friends and family! 5. What advice would you offer your readers and newbies at RFBC so they might enjoy your type of success? To newbies I say…Just do what Carlene says and you will be dropping those pounds in no time. It’s true! Carlene is an expert at weight loss. She knows what she is doing, no doubt about it. To readers I say…This is legit. This is the real deal. There is no better, easier, quicker way to health than this program. It’s simple and doable, and most importantly, it works! The sooner you join, the sooner you will start shedding those unwanted pounds. 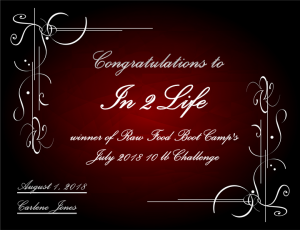 In2Life started camp on June 24th. With only 35 lbs to lose and having been vegan she was a little leery of our program working for her. Her first week she dropped 7 lbs. In July she won our 10 lb challenge with 11 lbs then won again in August with 10 lbs gone. We knew she couldn’t win again in September because she didn’t have another ten pounds to lose. She lost 7.4 lbs. As I said before she had to fight for every pound with herself and her very efficient body, but she did it. She did it and all that work paid off.